Looking for code review tools? Code review process can surely be improved by use of appropriate source code review tool. When we use tools for code review many mundane tasks are eliminated. A code reviewers job is focused on better quality issue finding when its supported by best code review tools. When a review is performed, its important to keep track of findings in review. In large team, changes can be difficult to track. Most of these online code review tools will reduce the burden of tracking and remembering things thereby ensuring better quality software. It is a proved fact that software development is not an easy task. If the programmer makes a minute mistake, it can become very hard for the software to work accurately. With a tiny mistake in software, the company can lose thousands of dollars and the security of the software can be breached. So, it is necessary to detect each and every error in the program before the software can be deemed complete. The main function of code review tools is to detect these mistakes and inform the programmer to correct the issue. The following are some code review tools which are used by programmers for improving code review process during their software development lifecycle. Pfabricator can be defined as an open source software engineering platform which includes various open source web applications. These web applications assist software companies for building better software. Gemit can be defined as a web based code review system which facilities online code reviews by using Git version control system. The code review becomes easier as it shows changes in a side by side display. 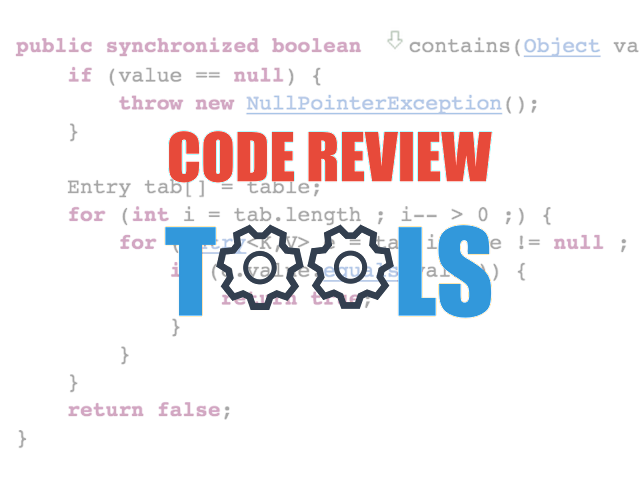 Review Board makes the code review easy and saves your money, time and efforts. It helps you to focus on the creation of great software. Also, the company updates the features of this code review at regular intervals. Rhodecode enterprise code approval system ensures the highest standard of code in any software with tough parameters. With strictest peer code review tools, it removes lot of issues from the source code. This is one of the best code review tool from Google wherein users can discuss the defects in the code and review the code. Crucible peer code review can be equated with quality code review which also discusses the changes which can be done, furthermore it identifies the defects in the code. Review Assistant can be defined as the code review plugin for visual studio to create various review requests and offer a response inside system. This code review supports various platforms such as Perforce and GIT. Barkeep is a fast and intuitive way of reviewing codes. With Barkeep, coders can view diffs or write comments. Collaborator can be defined as one of the best code review tools which helps the development, testing and management for creating and reviewing the source code for any team. It also allows peer code reviews for the team. Codestriker can be defined as the open-source web application which provides support for online tools for code review. It supports the traditional document review as well as diffs which are generated by the SCM system. The code review tool allows collaboration of the team for reviewing the code in an efficient and easy manner. It is done by the removal of overheads which are normally associated with the regular format of code inspection. It provides a complete solution for team system code reviews, and this tool and has become very popular with programmers. This code review tool uses the benefits of team system for reducing waste. Malevich can be defined as a point and click, web based code analysis tool which has been designed for small teams and individuals. The main goal of the source code review tool is to reduce the cost of making comments. This source code review software uses a plugin system for an integrated distributed peer review system to detect the errors in software code. The system provides a user-friendly web based environment as well. This is a simple code review tool which is open source and features a code review workflow which is non-blocking. Codifferous can be described as one of the code review tools which is used by busy software developers. Once your code is imported from BitBucket or Github, the software reads the code in a jiffy.. The software is proficient in the examination of computer codes in the development phase of software. It has been developed and designed specially to find and fix the mistakes. Review Assistant is the source code review tool which creates the review requests and its responses inside Visual Studio. It also supports various platforms such as Git and Mercurial.